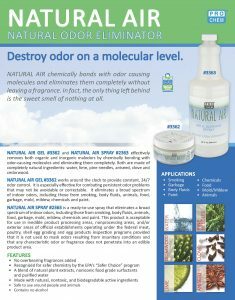 Natural Air Surface Spray | Pro Chem, Inc.
NATURAL AIR air and surface spray effectively removes both organic and inorganic malodors by chemically bonding with odor-causing molecules and eliminating them completely. It is made of completely natural ingredients: water, lime, pine needles, aniseed, clove and cedar wood. 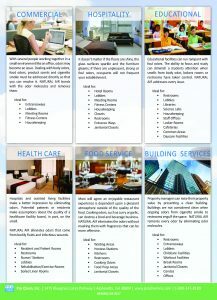 When sprayed on surfaces, it works itself deep into the material to eradicate odors that have penetrated the surface. 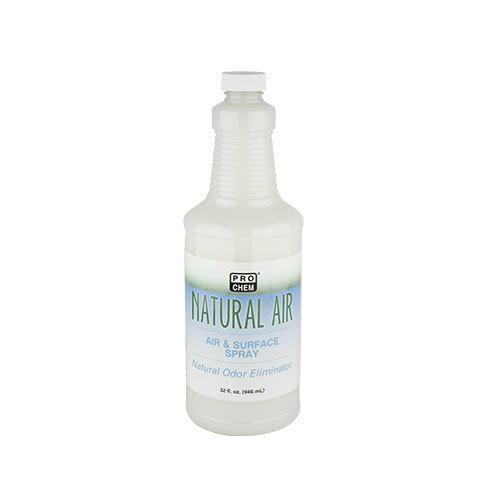 It is a ready-to-use spray that eliminates a broad spectrum of indoor odors, including those from smoking, body fluids, animals, food, garbage, mold, mildew, chemicals, and paint. This product is acceptable for use in inedible product processing areas, nonprocessing areas and/or exterior areas of official establishments operating under the federal meat, poultry, shell egg grading, and egg products inspection programs provided that it is not used to mask odors resulting from insanitary conditions, and that any characteristic odor or fragrance does not penetrate into an edible product area. For immediate, targeted odor control, shake and spray into the air or onto water-safe upholstery and fabrics. Can also be applied through a fogger. When initially sprayed, there will be a hint of fragrance which will dissipate as the product eliminates the odors. Product does not need to be reapplied until source of odor is reintroduced.